Sharon Martin and Mike Hughbanks share a passion for advocacy and outreach related to dementia throught Art to Remember, an interactive program at Joslyn Art Museum. Omahans Mike Hughbanks and Sharon Martin understand the debilitating nature of dementia from two distinct perspectives. At 60, Mike, former chief operating officer at Diversified Financial, brings the patient point of view. Diagnosed two years ago with young onset, early stage Alzheimer’s disease, he is among 5 million Americans living with the affliction. Sharon, a longtime educator, witnessed the devastation of dementia as caregiver, daughter and wife. Both of her parents succumbed to Alzheimer’s disease. Her late husband suffered from a cancer-triggered dementia. “I learned how important it is to be an advocate for people who are going through challenges that impact their thinking,” she says. 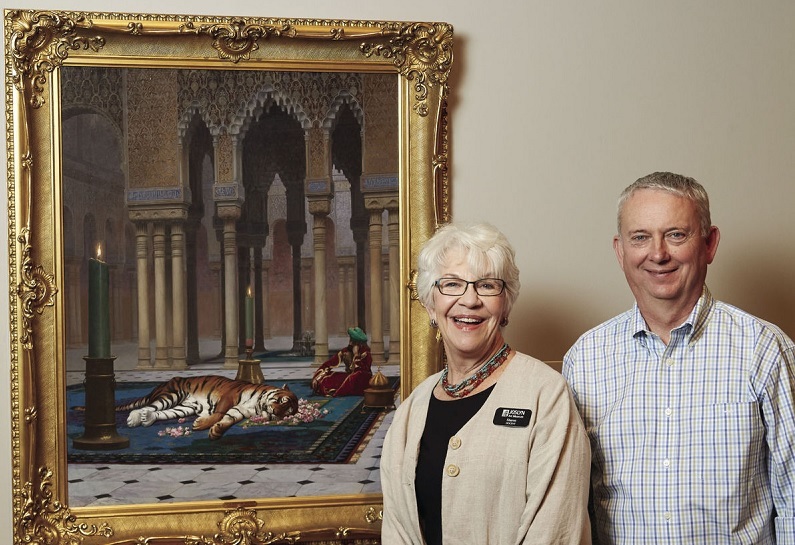 Though their perspectives differ, Sharon and Mike have found common ground for advocacy and outreach at Omaha’s Joslyn Art Museum, home to a program called Art to Remember. Funded by a Blue Cross and Blue Shield of Nebraska grant, Art to Remember utilizes Joslyn’s collection to stimulate the senses to encourage small groups of caregivers and PWDs (people with diagnoses: memory loss, early-stage Alzheimer’s and related dementias) to connect, socialize and rekindle memories while viewing works of art. Each tour, carefully curated and held every other month, revolves around a different universal theme — from food to leadership to love. Sharon is one of the program’s many specially-trained docents. 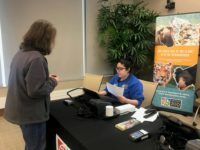 Given her personal and professional background, she was recruited by Susie Severson, Joslyn’s director of adult programs, to help launch the program in 2015 and assist with tour planning. “Being a tour guide, being a facilitator, engaging people in discussion is an art in itself. That’s where our docents come in,” Susie says. Mike was encouraged to get involved through his affiliation with the Alzheimer’s Association, a key Art to Remember partner. The self-described Type-A extrovert became an active Association volunteer shortly after his diagnosis, jumping at the chance to speak about his diagnosis before audiences and in TV interviews. He blogs about his experience at omalz.com. Mike and wife Debra serve as Art to Remember hosts and keep attendees informed of Art to Remember dates and times. Confronted by the ugliness of dementia in different ways, both the Hughbankses and docent Sharon have found something beautiful in Art to Remember. “It’s very rewarding for me to continue to be a learner and to facilitate anything that will help other people continue to learn as well,” Sharon says.